The football season is finally over for the Fighting Illini, and it couldn't have had a more fitting end than it did, which was a 50-14 drubbing at the hands of the Northwestern Wildcats at Ryan Field in Evanston. Illinois fans have not had much to cheer about this season, and since last season's win at Indiana, the Illini have proceeded to drop 14 straight conference games. If you are scoring at home, yes, that means that the Illini were 0-8 this season in Big Ten play after losing the final 6 games of the 2011 season. Not a good track record by any stretch of the imagination, and more questions than answers have surfaced as to the future of the program, not to mention the leader of that program. For all intensive purposes, the Illini offense was a disaster this season, and the defense wasn't much better, as they were outscored 385-200 on the season. Talk recently came up about the future of head coach Tim Beckman, but those rumors were quickly put to rest on Tuesday afternoon by athletic director Mike Thomas, who said that Beckman will be the coach in 2013. I don't know about you, but if I were Beckman, I would be worried, because the schedule doesn't get any easier to give the Illini a break next season. The John Groce era has begun with a bang, and so far, through 8 games, the Illini are 8-0 and ranked for the first time in nearly a year, entering both the USA Today Coaches' poll and the AP poll at #22. So far since Groce has been here he has transformed the Illini into a team that plays hard every possession. Yes, there have been a couple of close calls, especially last Sunday when they squeaked by the Runnin' Bulldogs of Gardner-Webb 63-62. Illinois went through the entire Maui Invitational without trailing, and seemed to have a little Hawaiian Hangover returning to Champaign. Whatever funk the Illini were in needed to be gone before they took on the Yellowjackets of Georgia Tech on Wednesday night in the Big 10/ACC Challenge. The current group of seniors have never lost in the challenge, and that streak continued with a 75-62 win, giving the Illini their fourth straight win in the annual competition with the ACC. It was a tight game the entire night, and until Joseph Bertrand went on a 10-0 run by himself to give the Illini a lead that it would never relinquish, the outlook was bleak. Brandon Paul, who didn't have his best game, still managed 15 points, but one major item of concern is the free throw shooting. The Illini were just 7-18 from the line, and that stat will have to improve from here on out, especially when the schedule gets a little tougher before the Big Ten season begins in earnest. The Illini will have a few days off to recuperate before next taking the court next Tuesday against the Catamounts of Western Carolina (7:00 pm CT, no TV). The start to this season is the best for a first year Illini coach in nearly 100 years. Hopefully, he can continue this early success to make Illini Nation forget Fighting Illini football. After stubbing their toe in The Bahamas in the championship game of the Junkanoo Jam, the Fighting Illini women's basketball team returned to the Assembly Hall to host the Wake Forest Demon Deacons in their own version of the Big 10/ACC Challenge. The Illini emerged victorious, winning 95-82 behind a double-double by Karisma Penn, who scored 30 points and grabbed 10 rebounds. Ivory Crawford added 26 points, while Amber Moore chipped in 11 points to help improve the Illini's record to 4-2 on the season. In The Bahamas, the Illini got by Iowa State 68-50 last Friday before losing to Tulsa less than 24 hours later 82-75. Still, it was a trip that Coach Matt Bollant said was a learning experience. After all, Bollant is still in the beginning phases of his tenure at Illinois, and the players, as a result, are learning his system as well. The Illini don't have a lot of time in between games, as they are back in action on Saturday afternoon when they host Colorado (1:00 pm CT, BTN.com). I guess, since it still is technically football season, that I should lead off this week's blog entry with Illini football, even though I don't really want to. Although the Illini season will be done after this Saturday's game, this has been one that many in Illini Nation will want to soon forget. Perhaps the most winnable game remaining on the schedule almost resulted in a win, but it was still a loss and as a result, dropped the Illini to 2-9 overall and 0-7 in the Big Ten. It is no secret that Tim Beckman has struggled in his first season as the Illinois coach, and there very well could be some coaching changes in the off-season. 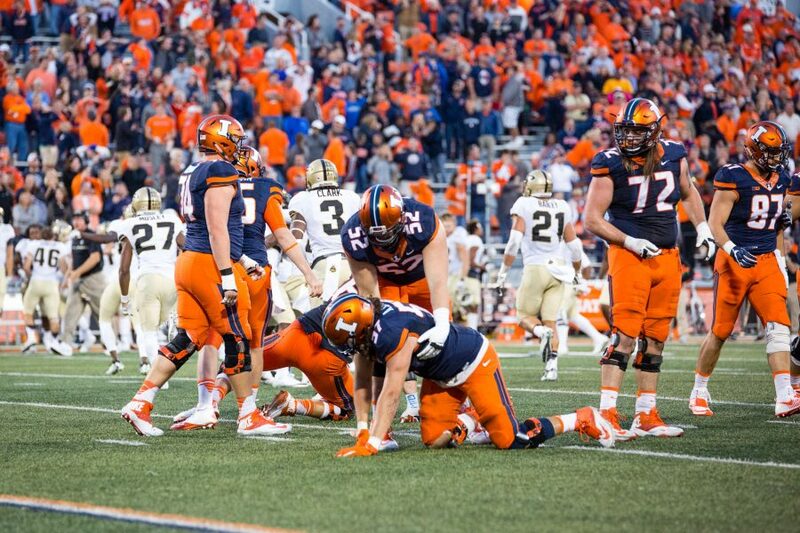 The Illini were defeated last Saturday on Senior Day by a 20-17 score to the Purdue Boilermakers, who are still in the hunt for a bowl berth. This was a game that the Illini could have won, but the same miscues that have plagued them all season came to roost against the Boilers, and the chance to break the long conference losing streak came and went. There is not much hope for ending this streak in the final game of the season, when the Illini head north to Evanston to battle the Northwestern Wildcats this coming Saturday (11:00 am CT, BTN). The Wildcats, or "that team up north", as quoted by Beckman, are 8-3 overall and are still very much in contention for a New Year's Day bowl game. So far, so good on the John Groce era at Illinois, as they have gotten off to a fast and successful start. After beginning the season with two wins at home, the Illini made the long trip to Hawaii for four games, starting off in Honolulu with a come from behind win over the Rainbow Warriors of Hawaii 78-77 in overtime. The Illini were down by as much as 16 points in the game before making a remarkable comeback and getting the win on a last second jumper by D. J. Richardson at the buzzer. Just the fact that the Illini held their composure was a sign of good things to come. After the game against Hawaii, the Illini did some island hopping onto the island of Maui to compete in the EA Sports Maui Invitational, where they faced some tough competition. The first test was the Trojans of USC, which proved to be no match at all, as the Illini prevailed 94-64, once again shooting lights out from beyond the arc. That earned the Illini a berth in the semifinals against host Chaminade, a Division II school that knocked off Texas in their first game. It was more of the same for the Illini against the Silverswords, as they won 84-61 to advance to the championship game of the tournament against Butler, who upset #9 ranked North Carolina in the semifinals. There is something about this new energy for the Fighting Illini, and it showed once again as the Illini defeated Butler 78-61 to capture the Maui Invitational title. Brandon Paul once again led the Illini in scoring with 20 points, while Tracy Abrams added 17. Tyler Griffey and D. J. Richardson each netted 14 points to propel Illinois to a 6-0 start, and momentum heading into the Thanksgiving holiday. In the three games in Maui, the Illini never trailed, but more importantly, have hit the double digit mark in three pointers made in each game this season. They lead the nation in that category. The Illini will return home for a couple of games this coming week, first taking on Gardner-Webb on Sunday afternoon (3:00 pm CT, BTN), followed by the Big Ten/ACC Challenge against Georgia Tech next Wednesday (8:00 pm CT, ESPN2). Coaching can make a difference, and that point is very evident so far this season. After losing for the first time this season, Matt Bollant's Illini women's basketball team returned to their winning ways by defeating Cleveland State 83-64 last Sunday at the Assembly Hall behind Ivory Crawford, who scored 32 points to help lead her team to victory. Karisma Penn added 17, while Amber Moore scored 12 to push the Illini's record to 2-1 overall. The Illini will head to their own tropical paradise to play in the Junkanoo Jam in the Bahamas at Grand Bahama Island. The Illini will face Tulsa on Friday afternoon (3:45 pm CT, no TV), then will take on either Iowa State or Loyola Marymount on Saturday. A very successful season for the Illini women's soccer team came to an end last Friday evening when they were defeated 9-2 by coach Janet Rayfield's alma mater, North Carolina, in Chapel Hill. The Illini can hold their head high for even getting this far, having made a deep run in the Big Ten Tournament to put them in position to get the NCAA berth, then getting a win in that tournament as well to force the matchup with the Tar Heels. The Illini finish the season at 10-9-4 overall, and have great visions of either matching or exceeding their success next season. Needing to run the table in order to put themselves in position for an NCAA Tournament berth, the Fighting Illini women's volleyball team fell short of that goal by losing at Michigan State last Friday night. The Illlini came back and defeated Michigan on Saturday evening, then dispatched Northwestern in 5 games on the night before Thanksgiving up in Evanston. The Illini will close out the season on Saturday night when they travel to Iowa City to battle the Hawkeyes. Yes, it has been a disappointing season for the Illini, but with the tough schedule that they played, plus losing some top flight players from last season's national runner-up team, it was bound to happen. The Illini are currently 13-16 overall and 7-12 in conference play. They will return to prominence in the not too distant future. No offense, but I am almost glad that this Illinois football season is about over. I actually could have stopped that sentence after the first two words, because the lack of offense this season is much of the reason why the Illini are 2-8 overall and in the basement of the Big 10. The latest setback was a 17-3 loss to the Minnesota Golden Gophers, who became bowl eligible with the win. The Illini offense, in a word to describe it, has been anemic lately, and with the apparent infighting within the coaching staff on who calls plays on which downs, something besides the players on the field could be some cause for blame. It was brought out in the open last week that there are some coaches that may not be returning next season, and that ultimately falls on Tim Beckman, who hired them. I know that the Illinois football job isn't one of the most coveted, but you still need to get coaches in here that can work well with the head coach. It could, ultimately, come down to players, because this season shows that the last two years of the Ron Zook era didn't produce the best recruiting classes. The Illini, desperately seeking a win any way that they can, will lace 'em up again on Saturday in the home finale against the Purdue Boilermakers (2:30 pm CT, BTN). The Boilers haven't exactly been a success story this season, but they are 4-6 overall and 1-5 in the Big Ten, and still have a legitimate shot at a bowl berth with a win over the Illini on Saturday and a win against Indiana next weekend. The Illini are a dismal 2-8 overall and still winless in the Big Ten at 0-6. Nobody expected to see what is transpiring this season, and who knows what the future will hold? Of the 20 seniors playing their final game at Memorial Stadium this weekend, quite a few of them have aspirations of playing in the NFL, so the lack of talent for next year's team will not bode well for wins, as the schedule gets a whole lot tougher when Nebraska comes onto the schedule. Just take a wait and see approach, I guess. The John Groce era at Illinois is off to a good start, with the Illini getting out to a 2-0 start with early wins over Colgate and St. Francis (NY). The Illini defeated the Terriers of St. Francis 89-64 on Monday evening at the Assembly Hall, as senior Tyler Griffey led the Illini with 17 points, which was one point off his career high. Already two games into the Groce era, this teams looks markedly different than it did under Weber last year, although most of the cast of characters are the same. The next few games will tell a lot about what this year's team will look like, as the Illini head to Hawaii to play four games on the islands of Hawaii and Maui. The first game will be on Friday evening, when the Illini take on the Rainbow Warriors of Hawaii (11:30 pm CT, No TV, however the game will be streamed online for free at OCSports.tv). Following the game against Hawaii, the Illini will hop islands and play in the EA Sports Maui Invitational starting on Monday evening against the USC Trojans (11:00 pm CT, ESPN2). This will be a good early season test for the Illini, and the first time that they have played away from home this season. Groce also landed a great first recruiting class, inking five players for the class of 2013. The Simeon duo of Kendrick Nunn and Jaylon Tate headline the class, as well as Malcolm Hill, Maverick Morgan, and Austin Colbert to round it out. With this recruiting class being nationally ranked, the Illini are once again on the way up and success could be headed back to Champaign sooner than later. Stay tuned. Along the same lines as the men's basketball team, the Illini women also have a new coach, and the Matt Bollant era is officially underway in Champaign, with similar results. After opening the season with a win 84-52 over Evansville last Sunday, the Illini welcomed Bradley to the Assembly Hall and couldn't match the Braves' quickness, falling 83-77 behind another monster game by Karisma Penn. Penn led all scorers with 29 points and grabbed 16 rebounds, but it wasn't enough as the Illini fell to 1-1 on the season. The Illini will continue non-conference action on Sunday afternoon when they host Cleveland State (2:00 pm CT, No TV). The season appears to be winding down for the Fighting Illini women's volleyball team, and the possibility of postseason play is all but a memory now. With no margin for error now, the Illini welcome Michigan State and Michigan to Huff Hall for their final home matches of the season. Michigan State comes in on Friday night (7:00 pm CT, BTN.com), while the Wolverines visit Champaign on Saturday evening (7:00 pm CT, No TV). The Illini lost both matches on their recent swing to the eastern part of the Big Ten, losing 3-0 at Penn State, and then falling at Ohio State in 5 games. With the Illini currently sitting at 11-15 overall, but just 5-11 in the Big Ten, they need to win out this weekend and next to even have a chance to qualify for the NCAA Tournament. Strength of schedule may actually help them, but if they don't get four wins in the last four matches, then the point is moot. Finally, the Fighting Illini women's soccer team is enjoying postseason play, and will travel to coach Janet Rayfield's alma mater of North Carolina to face the Tar Heels on Friday evening (5:30 pm CT). The Illini survived Missouri in Columbia, winning on penalty kicks to advance to the next round. The Illini come into the match with the Tar Heels at 10-8-4 overall, while North Carolina, ranked #13 in the country, are 11-5-2. I normally begin each weekly blog with the report on the Illinois football team. Well, everyone knows what is going on within that program right now, so I will begin this week's entry with men's and women's basketball. No offense to Tim Beckman, but those programs show much more promise than the football team does. John Groce's Illini basketball team has finished up exhibition play, and even though the final score would indicate a close game, it really wasn't as close as what the score would show you. The Illini defeated West Chester, a Division II school from Pennsylvania, 75-66 on Sunday afternoon at the Assembly Hall in Champaign. The Illini held a lead as large as 27 points during the game, but didn't have a very good stretch in the second half, thus letting West Chester back in the game. At one point, Groce replaced his lineup with 5 brand new players, but quickly retracted them once the lead fell below 10 points. The Illini have a lot of work to do, and not a lot of time to get a lot accomplished, as they begin the season on Friday night when they host Colgate at the Assembly Hall (7:00 pm, CT, No TV). This game will mark the official beginning of the Groce era, and the Orange Krush will be ushering it in style as they welcome Groce by bringing out "Orange Hush", a nod to Groce's alma mater, Taylor University. The Krush will remain silent from the beginning of the game until the Illini score their 10th point of the game. At that point, they will cheer wildly, and they are asking the fans going to the game to participate in the event as well. Let's just hope that the game doesn't resemble the Penn State game a couple years ago, when the Illini barely hit the 10 point mark before halftime. If that happens, prepare for a very quiet Assembly Hall on Friday night. Things have started off very well for Matt Bollant and the women's basketball team, and if Tuesday night's final exhibition tuneup is any indication, then the season should be a very exciting one. The Illini totally obliterated Concordia University 120-29 at the Assembly Hall, as seven players scored in double figures and the Illini's defense forced 53 turnovers in the game. The leading scorer for the Illini was Taylor Tuck with 20 points, while Amber Moore added 16. The Illini took a 65-13 lead at the half, and really never had any issue from that point on with their guests. The season tips off for real this Sunday when the Illini host Evansville (2:00 pm, CT, no TV). Now, for some football. I made my first trip to the 'Shoe last Saturday to cover the game, and came away impressed at the facility, but not the action on the field. The Illini once again went down to defeat 52-22 to the Ohio State Buckeyes, and were never really in the game except for the first quarter. The Illini scored first on a field goal by Nick Immekus, who returned from an injury that has sidelined him for the past several weeks. The Buckeyes answered with a touchdown, and then the Illini traded another field goal for yet another touchdown. So, you can see the score discrepancy as the Illini kept getting field goals while the Buckeyes were scoring the touchdowns. One bright spot of the game was the return of Corey Lewis, who had been sidelined for the past couple of years with various injuries. Lewis was emotional upon his return, as was expected, and Beckman has petitioned for a sixth year of eligibility for a medical redshirt. The Illini return for the first of two final home games on Saturday when they host the Minnesota Golden Gophers (2:30 pm, CT, BTN). On paper, the Illini have a shot to beat the Gophers, but coach Jerry Kill has Minnesota playing their best football of the season. Therefore, a win will be difficult, but definitely not out of the question. The Illini are a dismal 2-7 overall and still winless in the Big Ten at 0-5, and with the loss to the Buckeyes on Saturday, are officially eliminated from any bowl appearance. Not that they were going to anyway. The Fighting Illini women's soccer team wrapped up play in the Big Ten Tournament last Sunday, and made the championship game coming from the #5 seed. The Illini upset top seed Penn State to get to the title game, but was defeated by Ohio State 2-1. However, the Illini's tournament success earned them a berth in the NCAA Tournament, where they will be facing Missouri on Saturday evening (6:30 pm, CT) in Columbia. The Illini enter NCAA Tourney play at 10-8-3 overall. The road for Kevin Hambly's Illini women's volleyball team has been anything but easy this season, and time is drawing very thin for them to try and repeat to get to the Final Four as they begin their toughest road trip this weekend when they travel to #2 Penn State on Thursday evening (7:00 pm CT, BTN) and #15 Ohio State on Saturday night (6:00 pm CT, no TV). The Illini have struggled mightily since their appearance in the title game last season, and can ill afford any more losses. The Illini defeated Indiana last Friday evening at Huff Hall to improve to 10-13 overall, but still remain 5-9 in the conference. Nobody said it would be easy for the Illini this year, but I do not think they envisioned anything close to what they are experiencing. In order for the Illini to have any reasonable shot at a return trip to the NCAA Tournament, they pretty much need to win out, including these two this weekend. The increasingly long Illinois football season got a bit longer last Saturday, as the Illini once again did everything they could to beat themselves, and pretty much accomplished the feat in impressive fashion, losing 31-17 to the Indiana Hoosiers in front of a half-filled Memorial Stadium for Homecoming. From a standpoint of statistics, all signs would have pointed to an Illini win, and a temporary relief from the train wreck that has become Illinois football. The Illini have committed senseless turnovers all season, and they never seem to come at the right times of the game, only when they seem to hurt them the most. Also, the penalties continue to mount, and they, too, are being committed when they need them the least. But what can be done about this? I would hope that the players realize that they are making these mistakes, and a couple bounces here and there may have swung one of the games in the other direction. With the exception of the Wisconsin game, the Illini have not really been in any of the recent losses, and even in that game, the Illini totally fell apart in the fourth quarter. According to coach Tim Beckman, "you just can't continue to give them chances, especially deep in your own territory. As a result of all this, Tommie Davis has been removed from returning punts, since he cannot seem to catch one and bring it upfield. Those types of senseless mistakes are a huge reason the Illini are 2-6 overall and still looking for their first Big Ten win. It doesn't get any easier for Illinois, as they head east to Columbus, Ohio to battle the Ohio State Buckeyes this Saturday (2:30 pm, CT, ESPN.) The Buckeyes are 9-0 overall and 5-0 in the Leaders Division of the Big Ten, and although they are not eligible to go to a bowl game this year, they are still a pretty darn good team. Led by quarterback Braxton Miller, the Buckeyes have been rolling over teams with their high-powered offense. Ohio State is coached by Urban Meyer, who needs no introduction when it comes to winning championships. Meyer has had success wherever he has been, beginning at Miami of Ohio, and then going to Utah and Florida, where he won two national championships. Meyer's path has crossed several times with Beckman's, as they have been coaching partners in a couple of different spots. Will the student outduel the teacher this weekend? Don't bet on it. Things are beginning much better for new Illini basketball coach John Groce, as they held their first of two exhibition games last Saturday night by defeating Lewis University 79-47 at the Assembly Hall. Maybe it was the fact that it is still technically football season, or that there was a lot of other activities going on, but the game wasn't very well attended. Senior D. J. Richardson led three Illini in double figures with 12 points, while Myke Henry and transfer Sam McLaurin each scored 11 points. While it still is very early to gauge how this season will go with the new coaching staff in place, it already seems as if the current players have bought in to what Groce is trying to do, which is a breath of fresh air, especially the way the football season has gone. The Illini will have their final pre-season tuneup on Sunday afternoon when West Chester pays a visit to Champaign (3:00 pm, No TV). Perhaps the most exciting of the three Mike Thomas coaching hires have also started their season, and they as well won an exhibition game, defeating Marian University of Indianapolis 89-37 on Tuesday evening at the Assembly Hall. Coach Matt Bollant brings an exciting brand of basketball with him to Champaign from Wisconsin-Green Bay, and it already is beginning to show with the initial win of his Illini career. Karisma Penn led the way for the Illini with a double-double, scoring 24 points and grabbing 16 rebounds, while Alexis Smith and Amber Moore added 19 and 12 points, respectively. The Illini will continue exhibition play this coming Tuesday night when they welcome Concordia University to the Assembly Hall for a 7:00 pm tip. Hopefully the fans will begin to realize that Bollant is determined to change the culture of Illinois women's basketball and start showing up in much larger numbers than they are normally used to. The story for women's volleyball is not as rosy right now, as the Illini are still struggling through the Big Ten season, trying to muster up enough wins to somehow qualify for the NCAA Tournament, something that was not thought to be an issue once the season began. Sure, the schedule was tough, but there have been matches that the Illini have lost that simply should not have been done. The Illini losing streak has reached 4 straight matches, the latest coming on Halloween night when they went down in 5 games to #22 Purdue at Huff Hall. The Illini currently sit at 10-13 overall and 4-9 in the Big Ten, and will welcome the Indiana Hoosiers on Saturday evening (7:00 pm CT, BTN). With time running out on the season, every match counts now in order for the Illini to be one of the teams considered once the field for the NCAAs is announced. The Fighting Illini women's soccer team has entered post-season mode, and so far so good. The Illini won their first match in the Big Ten Tournament in Bloomington, Indiana on Wednesday by defeating Minnesota on penalty kicks to advance to the semifinals of the tournament. They next took on top-seeded Penn State on Friday morning and took the Nittany Lions down as well 1-0 to advance to the championship game on Sunday morning against the winner of the Ohio State-Michigan game. The Illini have shown a lot of resilience during the tournament, and just like last season when they took down Penn State in the championship game of the tournament, they are playing well when it counts. The Illini enter the championship game with an overall mark of 9-7-3.